In the beginning, there was Plotinus (c 204-270 CE). Well, not really the beginning—philosophy was millennia old and the Platonists had been around for over six hundred years, but Plotinus is generally thought to be the person who laid out the tenets that became the basis for Neoplatonism. Plotinus was likely an Egyptian. He studied in Alexandria, moved to Rome at age forty, and set up a school. The emperor’s wife Salonina was a patroness, but we don’t know if she studied with him. Plotinus had many students including several women: his landlady GEMINA, her daughter (also named GEMINA), a woman named CHIONA, and AMPHICLEA who married the son of another famous philosopher Iamblichus (below). Little is known of these women, except their names. The third generation brings us to Iamblichus (c 245-c 325 ) a super-star among the Neoplatonists. His writings influenced St. Augustine, Medieval monks, the Jewish Kabbalah, and Islamic mystics. He is called “a student of Porphyry” but that may be because they are separated by a generation. They had public differences over the practice of theurgy—the use of rituals and mysteries (literally “divine-working”)—to unite the soul’s inner divinity with the One. 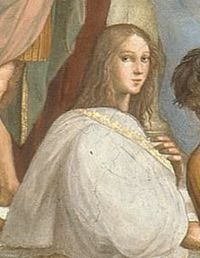 His son, Ariston, married Amphiclea (above), a student of Plotinus. He also addressed a letter to a woman named ARETE, who was in his circle and is presumed to be a student. Iamblichus is also our link to our first female teacher. Among his many students was a man named Eustathius (early 4th C) , who, according to, Eunapius in his Lives of the Philosophers and Spohists, “All men agreed that he was not only observed to be a most noble character, but also most gifted with eloquence…the renowned Eustathius married SOSIPATRA, who by her surpassing wisdom made her own husband seem inferior and insignificant.” In his Lives, Eunapius provides biographies of twenty-five male philosophers. Fully seventy-five percent of his chapter on Eustathius is devoted exclusively to Sosipatra. Sosipatra, born in Ephesus, lived and taught in Pergamon, a generation before Hypatia. Her story, as told by Eunapius, sounds quite fantastical to modern ears, but would not be out of bounds for the ancients. Supposedly two strangers appeared at her father’s estate when she was five, increased the output of the farm beyond expectation, and convinced her father to leave the farm, and his daughter, in their care for five years. When he returned, his daughter had “a mind not like a woman’s or a mere human being’s.” Her father believed the strangers to be gods or blessed spirits who had initiated his daughter into the Chaldean mysteries. As she grew, “she had no other teachers, but ever on her lips were the works of the poets, philosophers, and orators; and those works that others comprehend but incompletely and dimly, and then only by hard work and painful drudgery, she could expound with careless ease, serenely and painlessly, and with her light swift touch would make their meaning clear.” She continued to be regarded as a great seeress, predicting her husband’s death, and many other events. She had three sons, the oldest of whom followed in her footsteps. Aedesius (d. 355), another of Iamblichus’ students, taught in Pergamon. Eunapius states that, “After the passing of Eustathius, Sosipatra returned to her own estate, and dwelt in Asia in the ancient city of Pergamon, and the famous Aedesius loved and cared for her and educated her sons. In her own home Sosipatra held a chair of philosophy that rivalled his, and after attending the lectures of Aedesius, the students would go to hear hers; and though there was none that did not greatly appreciate and admire the accurate learning of Aedesius, they positively adored and revered the woman’s inspired teaching.” Her philosopher son, Antoninus, was an older contemporary of Hypatia’s who ran a school just outside Alexandria at Canopus. He predicted that the Christians would become ascendant and died just before they destroyed the temples in Alexandria and Canopus, thus solidifying his own reputation as an oracle. Syrianus (died c. 437), an Alexandrian by birth, studied with Plutarch in Athens and succeeded him as the head of the Academy in 431. He had a female relative, AEDESIA, who also studied philosophy. When Proclus studied with him and Asclepigenia, Syrianus very much wanted him to marry Aedesia. They became engaged, but Proclus broke it off after a “divine warning.” She later married another student named Hermias. They moved to Alexandria where he had a public chair to teach philosophy. When he died, leaving Aedesia with two small sons, she continued to receive that income, so she could raise and teach her children. She eventually moved back to Athens where her sons completed their education with Proclus. Aedesia lived to an advanced age. Both her sons became philosophers, but the oldest Ammonius (ca 435/445-517-526) was the better known. He returned to Alexandria and held the same chair as his father. He taught most of the important Neoplatonists of the late fifth and early sixth centuries. Women-philosophers.com, maintained by Kate Lindemann Ph.D.